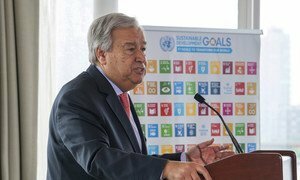 As governments prepare to meet later this year for the next round of climate talks, Secretary-General António Guterres today underscored the need to speed up action on an issue that is “the absolute priority” for the United Nations. “Climate change is the defining issue of our time – and we are at a defining moment,” the Secretary-General said at the Informal Leaders Dialogue on Climate Change, held on the margins of the annual high-level debate of the General Assembly. Mr. Guterres recalled that when world leaders signed the Paris Agreement on Climate Change three years ago, they pledged to keep global temperature rise to well below 2 degrees Celsius above pre-industrial levels and to work to keep the increase as close as possible to 1.5 degrees. These objectives were agreed, he noted, as the “bare minimum” to avoid the worst impacts of climate change. “The commitment was universal – but we are nowhere close to where we need to be to meet these minimum targets,” he stated, adding that a UN study found that the commitments made so far by Parties to the Paris Agreement represent just one-third of what is needed. Today’s meeting takes place amid what is known as “New York Climate Week” and comes on the heels of the Global Climate Action Summit, held in San Francisco earlier this month. It also follows a landmark speech delivered by the Secretary-General this month in which he warned that the world risks “crossing the point of no return” on climate change and highlighted the need to speed up action to tackle this global threat. A key moment on the road to next year’s Summit will be the 24th Session of the Conference of the Parties to the UN Framework Convention on Climate Change (UNFCCC) – known informally as COP24 – that will be held in December in Katowice, Poland.